This page is about the graduate-entry/ accelerated medicine course (A101). This course is an intensive four year medical course and has been designed for graduates who are trained in applied or experimental sciences. To find out about our standard-entry medical degree please visit the A100 page. The practice of Medicine offers a breadth of experiences impossible to find in any other subject. Every day brings different patients with different needs. It’s a great choice for scientists who strive to understand and apply research findings to improve the lives of the patients in their care. It offers a meaningful career that is prestigious, secure and relatively well paid. However, practising Medicine can be arduous, stressful, frustrating and bureaucratic and it’s not suited to everyone. You need to be sure that Medicine is the right choice for you. These pages will help you work that out, but there’s no better way to find out for sure than by gaining insight of medical practice by seeing it in action and talking to those who provide healthcare. Studying Medicine because that is what is expected of you is never a good idea: make sure that your motives for choosing to do so are well reasoned. The four-year graduate-entry/ accelerated course (UCAS code A101 BMBCh4) is open to graduates who already have a degree in an experimental science subject. After a two-year transition phase covering basic science and clinical skills, the accelerated programme leads into the final two years of the standard course and to the same Oxford medical qualification as the standard (six-year) course. The four-year course is designed specifically for science graduates, and places a strong emphasis on the scientific basis of medical practice. The first year of the course builds on your science background to cover most of the basic science that is needed for medicine, as well as essential clinical skills such as taking a clinical history and performing a basic physical examination. The aims of this year are for you to cover the core of medical science and clinical skills in which all medical students must be competent, to understand the application of science to clinical practice, and to gain experience in applying science and clinical skills to the process of diagnostic problem-solving. The second year builds on the basic science and clinical skills of the first year and leads to periods of more intensive clinical practice. By the end of this year, you should be able to recognise common disease patterns in medicine and surgery and be capable of reaching a diagnosis of the commoner illnesses. You should also be able to plan first-line clinical investigations. A nine-week clinical pathology ("Laboratory Medicine") block is interspersed with the clinical attachments. The science teaching continues throughout the year, oriented more directly towards clinical practice. You will be expected to review clinical trials and clinical research reports, and to appraise the application of such reports to clinical practice. For the final two years you will be fully integrated into the main stream of the standard clinical course. The third year consists of a series of attachments to clinical specialties such as orthopaedics, paediatrics and psychiatry. The aim of this year is to provide an overview of the major specialties within medicine, to allow you to recognize common complaints and to develop an understanding of when it is appropriate to refer a patient for specialist treatment. You can read more about this year of study on the clinical course pages of the Study Medicine website. The final year of the course is designed to prepare you for life after qualification, with teaching specifically aimed at practical matters of diagnosis and management. During the year there are also opportunities for special study, with blocks set aside for you to pursue areas of particular academic interest (normally this takes place within Oxford), and a ten-week elective period, which most students choose to take overseas. The final examination is in February of the final year, allowing several months before the formal end of the course for you to concentrate on preparing for practice in your Foundation Years. You can read more about this year of study on the clinical course pages of the Study Medicine website. First degree: The course is open only to graduates in applied and experimental science, including bioscience, chemistry, experimental physics and engineering. Check the list of courses that are typically acceptable. If your degree is not listed, or if you are unsure whether it is acceptable, please follow the steps outlined on the Medical Sciences website to find out more. A levels (or equivalent): In addition to your degree, you must also have two science A-levels, or equivalent qualification, of which one must be chemistry (unless you have a chemistry degree). 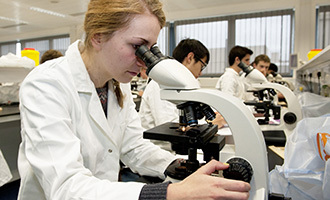 If your degree is in a subject other than bioscience, you must also have a qualification in biology at GCSE or O-level, or dual-award science GCSE, or an equivalent qualification. The application process for the graduate-entry/ accelerated medicine course (A101) is slightly different to those for the standard course. Please read this page carefully to ensure you take all the steps you need to make an application. For more information about any of the application stages please visit the Medical Faculty website. All candidates must take the Biomedical Admissions Test (BMAT) as part of their application and no student is admitted without interview. Any shortlisted candidate, including those from overseas, will be expected to come to Oxford for interview in December. Successful candidates must meet our requirements for health and fitness to practise. Applications for the accelerated, graduate-entry medicine course must be made both through UCAS (online) and direct to the University (on a supplementary form); this means applicants have two forms to complete. Please note that we cannot consider applications that are incomplete: you must complete both a UCAS application and an Oxford application form by the deadline in order to apply. Your UCAS form should be completed online, and must list Oxford as one of your choices: the course code for the fast-track medical course is A101 (the course title is BMBCh4). You must complete your UCAS application by 15th October 2019 for the course beginning in September 2020. If you wish to express a preference for a particular college, you should do so on your UCAS form. Further details of how to complete the University application form can be found here. The application form must be completed by 6pm, 15th October 2019. Please be aware that your referees will also need to provide their references before this deadline, in order to complete your application. We cannot consider applications that arrive after that date. All candidates must also take the Biomedical Admissions Test (BMAT) as part of their application. Separate registration for this test is required and it is the responsibility of the candidate to ensure that they are registered. We strongly recommend making arrangements in plenty of time before the deadline. Everything you need to know, including guidance on registration and preparation, can be found on the BMAT test page. Candidates for A101 graduate-entry/ accelerated medicine may choose either the August or October/November sitting of the BMAT. Test-takers must not take the test twice in one application round. Please note that competition to study Medicine at Oxford is particularly strong. There are only 30 places for accelerated/ graduate-entry medicine and only 19% of applicants are shortlisted for interview each year. For more information about the selection criteria used, please visit the Medical Faculty website. Oxford conforms to the UK Department of Health’s requirements regarding immunisation status and the GMC’s conditions on Fitness to Practise, and a satisfactory Disclosure and Barring Service check. Students may be refused entry to, or be removed from, the University’s Register of Medical Students on grounds that may be either academic or non-academic (for instance health or conduct). Applicants should be aware that some practical studies involving living animal tissue are an obligatory component of the course. Note that students must have reached their 18th birthday on or before the first day of full term in the first year of the course. A vast array of speciality training pathways is available after obtaining a medical qualification, ranging from General Practice or emergency medicine through obstetrics or ophthalmology to paediatrics or psychiatry. Of course, you need not remain confined to the clinic, ward or the operating theatre: the lecture theatre or the laboratory could also beckon. Some of our graduates end up leading the education of the next generation of doctors or directing biomedical research. You don’t need to know right now what you want to do when you qualify: the Medical School organises careers sessions for final-year clinical students and helps students learn about and apply for foundation house officer posts. Pre-clinical fees are charged in year 1 of the graduate-entry/ accelerated course (A101), although there are clinical elements of study throughout the course. Fees for the later years have not yet been confirmed but please note that these may be different from the pre-clinical fees. Clinical fees are charged in years 2 to 4 of the graduate-entry/ accelerated course (A101). As a guide, these are the annual fees for students who will complete the pre-clinical stage of their course and progress to the clinical years in 2019. For comprehensive funding information for medical students, please see here. For more information about fees and funding for this course, please see Funding for UK/EU Medical Students. Each final year student has a period of 10 weeks for elective study within the overall 48 weeks of the course. (This is year 4 for A101 students.) Your elective study may be conducted in Oxford, elsewhere in the UK, or anywhere in the world provided the content of the placement is appropriate experience for medicine. Approval must be granted by the Director of Clinical Studies. A student who stays in Oxford for their elective would be expected to incur no additional costs apart from their living costs. Many students opt to travel outside the UK in which case the additional cost is on average around £3,000, but may be lower or higher depending on location (very occasionally a student has spent up to £9,000.) Students who have not completed the core training in clinical medicine may be required to follow a prescribed course of study in Oxford for all or part of their 10 week elective instead of arranging a placement. There are opportunities to apply for additional financial support which varies depending on the destination proposed. This support is usually around £300 to £500 towards travel costs. Oxford Medical Sciences have been ranked number one for the last seven years in the Times Higher Education World University Rankings for clinical, pre-clinical and health sciences - the only non-North American institution to be top-ranked by THE in any subject discipline. Oxford's Medical School has been the highest rated for student satisfaction for the past ten years. You might like to have a look at the Introductory Reading for Medicine. You may also be interested in the Oxford Medical School Gazette.